Cardinal George Pell has been jailed for six years after being convicted of sexually abusing two boys in Australia. The former Vatican treasurer is the most senior Catholic figure ever to be found guilty of sexual offences against children. 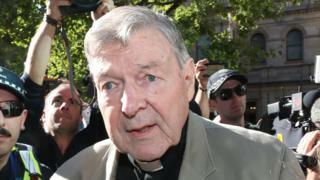 Pell abused the 13-year-old choir boys in a Melbourne cathedral in 1996, a jury ruled last year. The cardinal, 77, maintains his innocence and is appealing against his convictions. In sentencing Pell on Wednesday, a judge said the cleric had committed “a brazen and forceful sexual attack on the two victims”. “Your conduct was permeated by staggering arrogance,” said Judge Peter Kidd. In December, a jury unanimously convicted Pell of one charge of sexually penetrating a child under 16, and four counts of committing an indecent act on a child under 16. His conviction has rocked the Catholic Church, where he had been one of the Pope’s closest advisers. Abuse survivors were among those who travelled to Melbourne on Wednesday to witness Pell’s sentencing before a packed courtroom. Pell will be eligible for parole after three years and eight months. His appeal will be heard in June. What did the court hear previously? Last year, a court heard that Pell had abused the boys following a mass in St Patrick’s Cathedral in 1996, when he was archbishop of Melbourne. After telling them they were in trouble for drinking communion wine, Pell forced each boy into indecent acts, prosecutors said. He abused one of the boys again in 1997. The trial heard testimony from one of the victims. The other died of a drug overdose in 2014. The verdict was kept secret from the public until February, when additional charges of sexual offences against Pell – which he denies – were withdrawn by prosecutors. What did the judge say on Wednesday? Judge Kidd said Pell’s abuse was particularly callous because the cleric had been in a position of power. “You were the archbishop of St Patrick’s Cathedral no less, and you sexually abused two choir boys within that cathedral,” he told the County Court of Victoria. They were killed by an improvised explosive device in Afghanistan on Monday.